School of Fish: Good times with my parents! 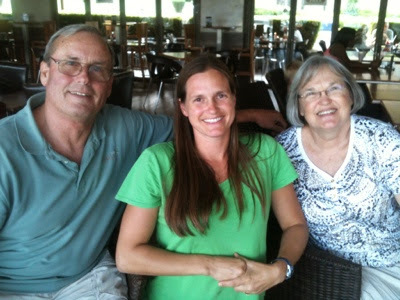 On Sunday, which was also Father's Day, my parents landed at Entebbe airport here in Uganda! It was so great to be able to be with my dad (and mom) on Father's Day! We have had some adventures together already and look forward to more. But I think my favorite part of our time together thus far has been watching my parents with the toddlers who live next door. The children at GSF call all the adults "auntie" or "uncle." The toddlers quickly fell in love with "Uncle Davie." They were chanting his name, trying to climb all over him and asking him to play ball. My mom sat down with the children and played "This little piggy" and talked with them and hugged them. 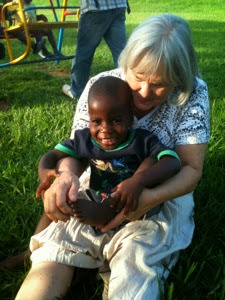 Here is "Auntie Susan" with Ivan. 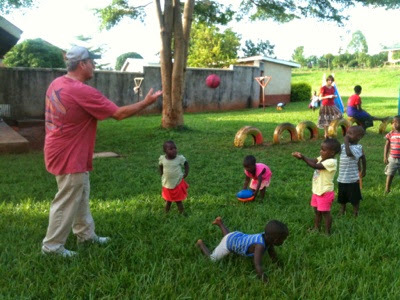 We have also had good times in Jinja showing them around town and going on a fishing trip. 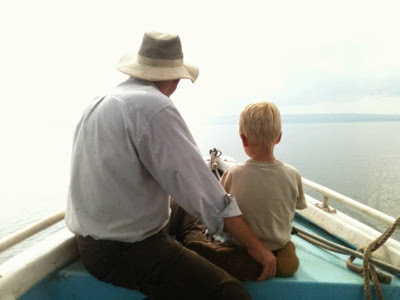 We enjoyed going out in the boat fishing on Lake Victoria and the Nile River, but no fish were biting. We did get to see a huge cobra that was down in the water while we were in the boat. I was not able to get a photo. We were more concerned with keeping a safe distance. But here is a cute photo of David and Zeke sitting in the bow. 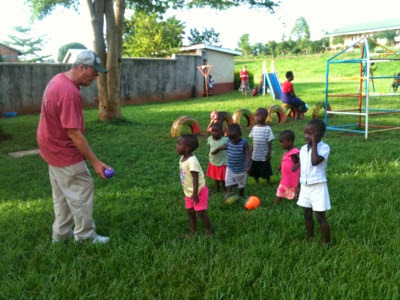 Tomorrow we plan to worship at our church in the village, then begin our travels to Western Uganda to take my parents on a safari. Please keep us in your prayers as we travel. I hope to have some great photos to share from our summer adventure!